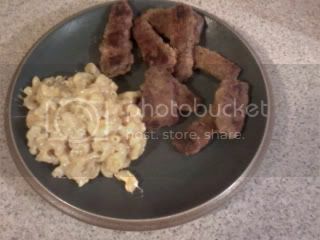 I made some Finger steaks using deer meat, also made some home made Mac and cheese, both were heavenly... washed them both down with a couple Busch Lights that I brought home from bear lake last weekend. Cover steak pieces in flour, beat two eggs and two table spoons of milk, dredge flour covered steak in egg mixture, coat in bread crumbs... once you have completed breading them, deep fry them in peanut or canola oil till golden brown. I was out of oil, so I pan fried them all in butter, they were awesome. Start by boiling the macaroni till tender but not mushy. preheat oven to hi broil. on med high heat melt butter in a fry pan, add onions and sauté till soft and translucent, add garlic and sauté for 1 min, add flour and whisk quickly, this will be clumpy and when it starts to go dark yellowish brown add the mustard and whisk well, turn the heat down to med low and slowly add the milk, whisk quickly while adding milk. Once all the lumps have disappeared add 3/4 cup of grated cheese and take off of heat, carefully stir the cheese in, once cheese has melted add macaroni folding carefully till completely coated. dump this into a casserole dish or leave it in the fry pan if you have the kind that are ok in the oven... spread remaining cheese over the top and sprinkle some bread crumbs over it put it in the oven and broil till top is darkened. Who's fingers there? Nice tho..
Only ever had the finger steaks outa beef. Will have to experiment. Looks mighty tastey. Looks good! I have some boneless geese breasts, should be good cooked that way. We do that alot with wild turkey breast. It'll make your tongue slap your brains loose!